Body Bargain (Amanda Lange; 30-Sep-2012; Z-code). Testers: Dietrich Squinkifer (as Deirdra Kiai), Dustin Ledford, Josh Breitbart, and Ryan Lange. IF Comp 2012: Tied for 8th place of 28 entries. Body Bargain - at IFDB. 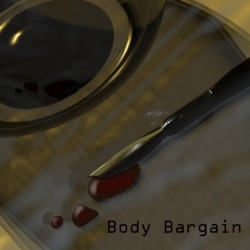 Body Bargain - at ifwizz interactive fiction (in German). IF Comp 2012 Post Mortem. Walkthrough: Download bodybargain-walkthroughs.txt from the IF Archive. This page was last modified on 23 June 2016, at 14:21.